Sour orange, Citrus aurantium, displays higher constitutive and earlier inducible direct defenses against the two-spotted spider mite, Tetranychus urticae, than Cleopatra mandarin, Citrus reshni. Moreover, herbivore-induced plant volatiles (HIPVs) produced by sour orange upon infestation can induce resistance in Cleopatra mandarin but not vice versa. 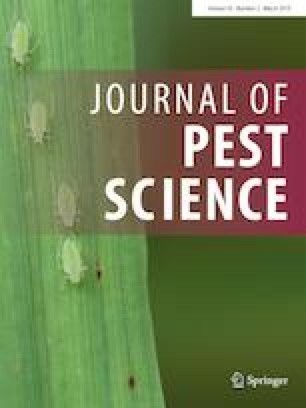 Because the role of these HIPVs in indirect resistance remains ignored, we have carried out a series of behavioral assays with three predatory mites with different levels of specialization on this herbivore, from strict entomophagy to omnivory. We have further characterized the volatile blend associated with T. urticae, which interestingly includes the HIPV methyl salicylate, as well as that produced by induced Cleopatra mandarin plants. Although a preference for less defended plants with presumably higher prey densities (i.e., C. reshni) was expected, this was not always the case. Because predators’ responses changed with diet width, with omnivore predators responding to both HIPVs and prey-related odors and specialized ones mostly to prey, our results reveal that these responses depend on plant genotype, prey presence and predator diet specialization. As the different volatile blends produced by infested sour orange, induced Cleopatra mandarin and T. urticae itself are attractive to T. urticae natural enemies but not to the herbivore, they may provide clues to develop new more sustainable tools to manipulate these agriculturally relevant species. Marc Cabedo-López and Joaquín Cruz-Miralles should be considered joint first author. The online version of this article ( https://doi.org/10.1007/s10340-019-01107-7) contains supplementary material, which is available to authorized users. The research leading to these results was partially funded by the Spanish Ministry of Economy and Competitiveness (AGL2014-55616-C3; AGL2015-64990-2R). The authors thank M. Piquer (UJI) for technical assistance. MC received a pre-doctoral fellowship from the Spanish Ministry of Economy and Competitiveness (BES-2015-074570), and MP was the recipient of a research fellowship from INIA, Spain (subprogram DOC INIA-CCAA).